Clarke, Snow & Riley is a Certified Public Accounting and Management Consulting firm. Our mission is to help you plan, achieve, and manage your business success. We work with entrepreneurs, smaller and middle-market companies, and family businesses in New England, the U.S., and worldwide. 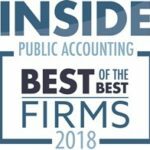 Clarke, Snow & Riley has been named to the INSIDE Public Accounting (IPA) Best of the Best list for 2018. The firm was recognized as one of the ten Best of the Best in the “Under $5 Million in Revenue” category. We at Clarke, Snow & Riley take great pride in the quality of our staff. Our accomplished professionals have in-depth experience and understanding of unique and complex business challenges and personal situations. Head over to the Leadership page to learn a little more about the CSR management team. These experienced and talented professionals will work closely with you to help you achieve your business success.